Hiring locum tenens physicians can be a real lifesaver for facilities. A locums doctor offers both staff and patients much-needed support and care while also ensuring the facility continues to drive revenue. However, not understanding how to bill for them can cost money in the short term and frustration in the long term. This article is designed to help administrators and recruiters understand the right way to do it so every facility can enjoy the full benefits that come from locum tenens. Know the difference between replacement and supplemental services. The first thing to understand is how to classify your doctor. Under the replacement services distinction, a locum tenens doctor is used in place of a regular staff physician for a limited duration, typically 60 days or less. Conversely, supplemental services are used for doctors who are added to current staff. These doctors may be helping grow a practice or augment the services available. Due to Medicare restrictions, you will typically follow the same procedure as when supplemental services are needed if you need a replacement provider for more than 60 days. Billing for supplemental physician services. Enroll your temporary physicians using the standard Medicaid and private payer process required by your state and insurance carrier. Note: Billing for Medicaid and private payers varies from state to state and carrier to carrier, so inquire with individual vendors if you have questions. Section 30.2.7 of the Medicare Claims Processing Manual covers billing for supplemental physician services. It allows a carrier to make payments to your group for services performed by a supplemental physician with a contractual agreement to see your patients. However, the entity receiving payment and the physician are jointly responsible for any Medicare overpayment. Additionally, the physician has unrestricted access to claims submitted by an entity for services he or she provided. When using services performed under a contractual arrangement, the supplemental provider will complete the necessary applications to bill for services with each of your private carriers and the Medicaid program for your state. You also need to have your locum tenens physician complete a Medicaid and private career application and Medicare form 855R. Billing for replacement physician services. If your locum tenens physician will work more than 60 days, you should begin the standard enrollment process early. However, you can bill Medicare with code modifier Q6 on the CMS 1500 section 24D for up to 60 days and should do so for doctors who work less than 60 days. There is a chance Medicaid and private payers may still require standard enrollment, so check your state and insurance carrier guidelines to be sure. Section 30.2.11 of the Medicare Claims Processing Manual covers billing for locum tenens services. It allows a practice to bill for temporary physician services during a regular physician’s absence. The regular physician must arrange coverage for no longer than 60 continuous days and then enter HCPCS code modifier Q6 after the procedure code during the billing process. As with section 30.2.7, the entity receiving payment and the physician that provided the service are jointly responsible for any Medicaid overpayment, and the physician has unrestricted access to claims for his services. 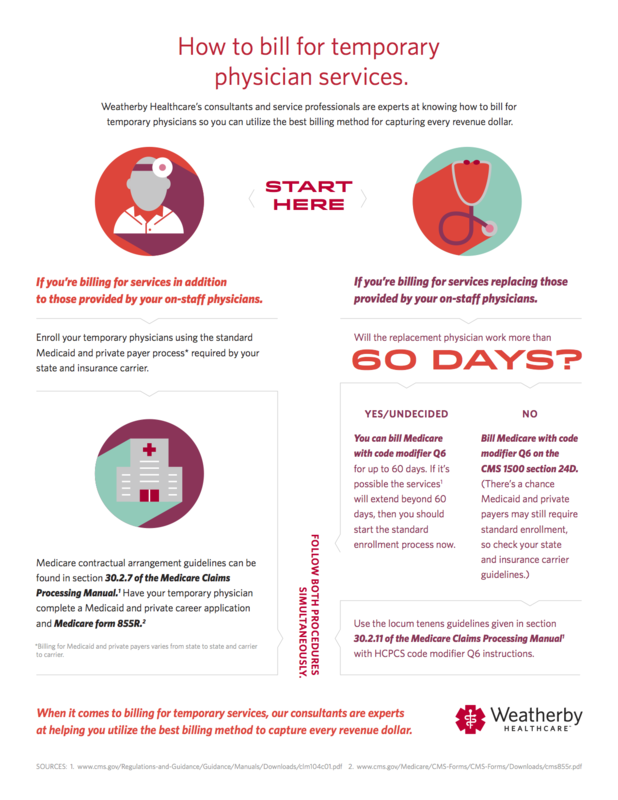 Check out this infographic for a visual look at billing for both supplemental and replacement locum tenens physicians, and reach out to a Weatherby Healthcare consultant if you have further questions.